Back when I was working in retail gardening, a lot of people would confuse annuals and perennials. It makes sense. “Annuals” sound like something that come back every year–or should, anyway. So I came up with the little reminder “perennial is perpetual” to help folks to remember which is which. While this is technically true (barring some unforeseen events like the October 2011 snowstorm, Superstorm Sandy, or a mail truck backing over your lavender [that’s a post for yet another time!]) it doesn’t mean that just because they come back, you don’t need to care for them. 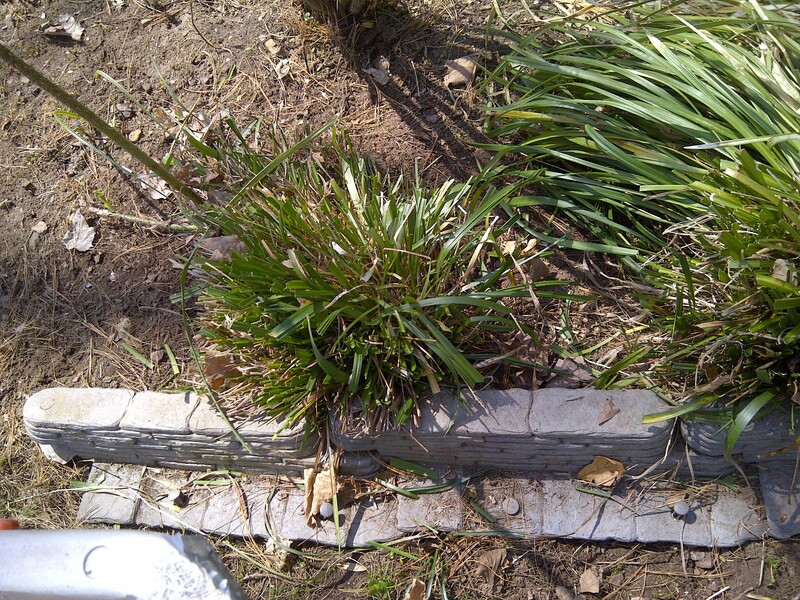 For example, the perennial at the top of this post is liriope, or lilyturf grass. It’s a great, tough as nails plant; it can work as a ground cover in both sun and shade; it increases in size every year–workhorse perennial. But, I ask–would you call that a “no care” plant? Would you want to look at that all summer? I hope not! This is what it looks like after its spring “haircut.” Most years you’d be able to see the new shoots coming up from the middle of the clump. This year, because it’s been so dry, there are no new shoots yet. I think this is the first time I’ve actually gotten the trimming done before the new growth started! 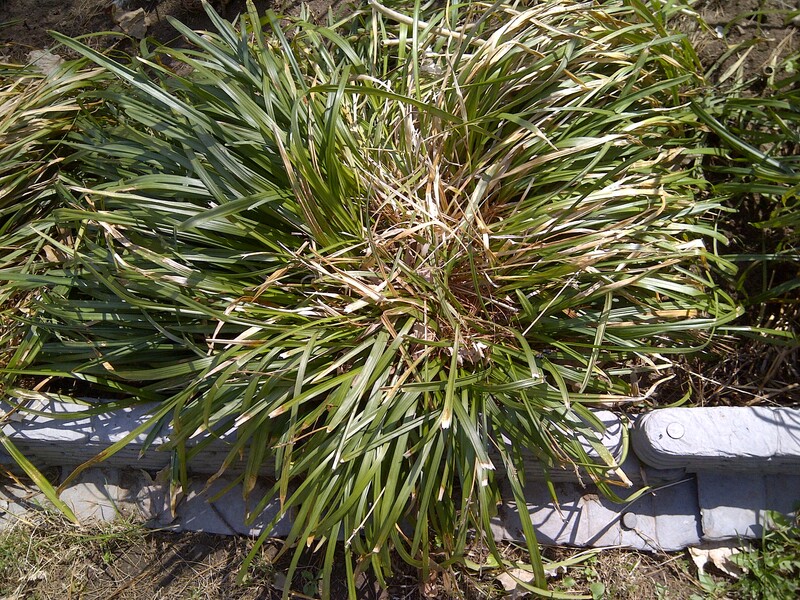 So while perennials are great, “easy care” plants, they do require some maintenance. And if the truth had to be told, I could probably stand to divide these too. But I don’t have to, thankfully. Because I have a lot of other work that must be done. 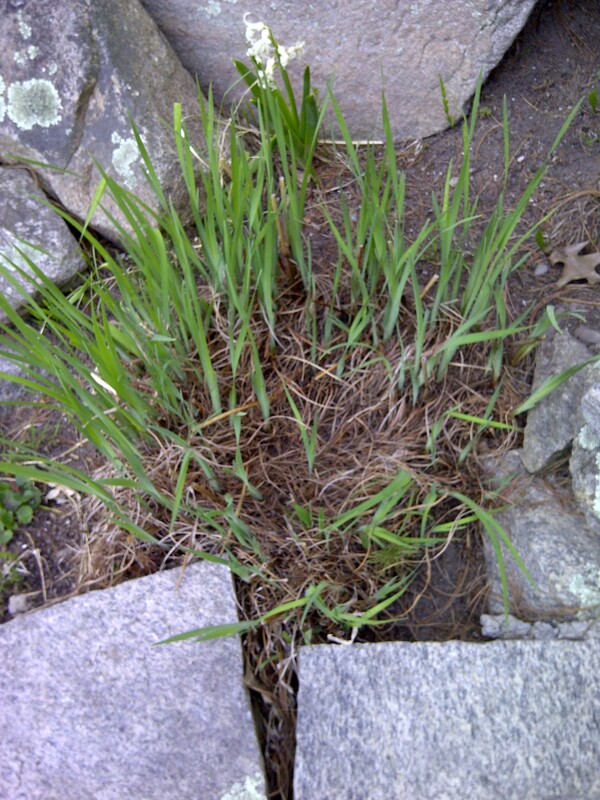 Here, for example, is a clump of siberian iris. It’s in desperate need of dividing–see that dead area in the middle? What should happen is that I should dig the whole thing out, section off the outer clumps and replant them and discard that “dead zone” in the middle. Will I get to it this year? Most likely not. But don’t let anyone kid you. While perennials come back every year, they are not “easy care” or “no work.” If you want that, get plastic plants! Thanks for the great reminder. I need to divide some of my perennials. Thanks for reading and commenting. I love your posts as well. When you’re done with your dividing….